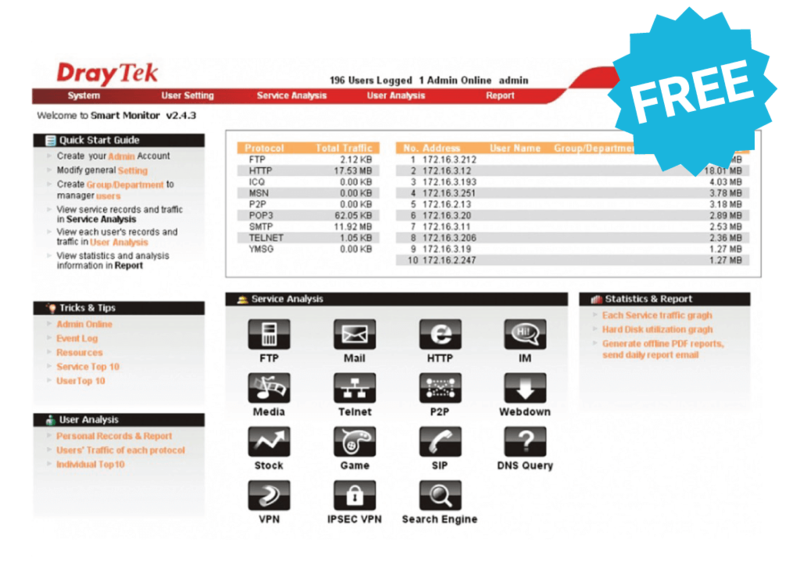 For each Vigor device listed below, DrayTek provides a FREE software, Smart Monitor, for SOHO/SMB users to record and report on network traffic and activity, so as to improve network efficiency and security. Network administrators can pinpoint heavy network users and ensure Internet usage conforms to the business network usage policy. The first thing that Smart Monitor can do for the enterprise is to solve the network problem. By verifying network information, Smart Monitor can assist enterprise’s administrator to solve different problems derived from the network application effectively. No matter network logging record, e-mail record or IM chatting record, or file download, Smart Monitor can analyze and arrange those records clearly and well for the administrator to manage and check with ease. The example is “Smart Monitor” with Vigor2860 Series which support up to 30 nodes.